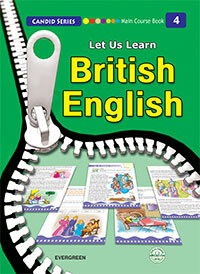 Let us learn British English follows a communicative approach to teaching and learning English and uses an innovative "Learning Cycle" methodology for gradually and consistently entrenching reading, writing, speaking, listening and lexicon skills in children. Learning Cycles use visual, auditory and kinaesthetic modes of presenting information to generate a favourable learning response from the children. The content has been carefully chosen to make the reading of the lessons an enlightening and enjoyable experience. The experiences are diverse in nature and develop the ability of children to thoroughly understand and analyse the subject under discussion. Children get trained to understand and respond clearly using appropriate grammar and vocabulary in short but expressive sentences, orally and while writing. The series explicitly and implicitly reiterates the need to improve and use correct pronunciation while communicating orally. The activity-oriented approach used in this series ensures that children are incited and given ample opportunities to unwind their creative senses and freely express their emotions and feelings. Exquisite artwork in the series makes the content expressive and the reading activity more involving for children.